Arkansas State adds Wake Forest Transfer. Melo Eggleston, a 6-8 wing from Suitland, Md., is transferring to Arkansas State to play men’s basketball, head coach Mike Balado announced Wednesday. 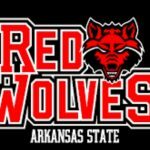 Eggleston will join the Red Wolves for the rest of this season and be eligible to play beginning in December of 2019. Eggleston comes to Jonesboro after one season at Wake Forest where he appeared in 21 games as a freshman in 2017-18. He averaged 1.0 points and 1.1 rebounds in 5.0 minutes per game. Coming out of high school, Eggleston was rated a four-star player by both ESPN and Rivals with scholarship offers from more than a dozen higher-resource conference schools including Georgia, LSU, Virginia Tech, Nebraska, South Carolina and Oregon State before choosing Wake Forest. He was a consensus top-50 player in his class as a high school sophomore before a foot injury as a junior. He played his senior season at Notre Dame Prep in Fitchburg, Mass. He participated in the Crab Ball Classic, where he won the dunk contest and has also participated in the Iverson Classic Regional Game and the Triple Threat All-Star Game. He played AAU ball for D.C. Premier and Team Belief.